Brain Injury Australia’s Executive Officer co-hosted, with multinational professional services firm Pricewaterhouse Coopers, a breakfast conversation on “Making the Link Between Family Violence and Brain Injury” at its Sydney headquarters on the 14th November, in front of 150 of Pricewaterhouse Coopers’ staff and clients. 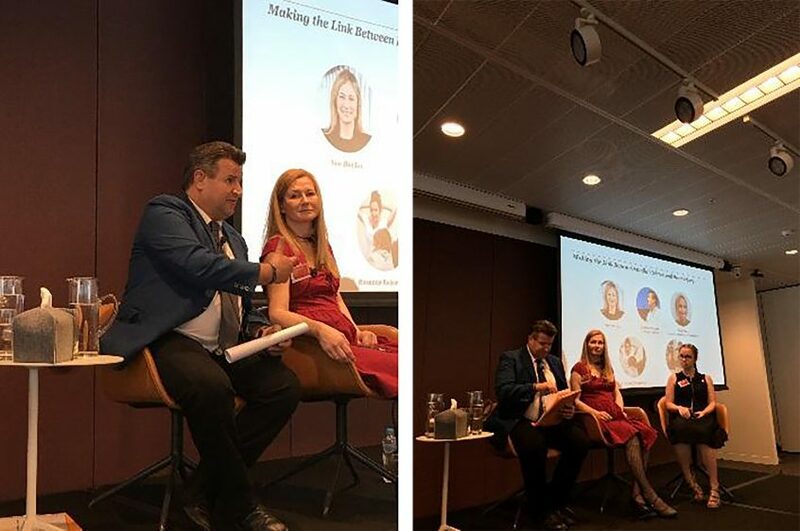 The breakfast featured Nick Rushworth in conversation with two extraordinary women – both severely and brutally injured, both achieving phenomenal recoveries. In 2007, leaving a pub after an argument, Rosanna Robertson’s then boyfriend pulled a gun and shot her point blank in the back of the head. She spent three months in hospital, and six months in rehabilitation. Prior to her injury she ran a corporate yoga business. She now teaches adaptive yoga classes to other people with a disability. Having just finished university, 25 year-old Rebecca Sciroli had her sights set on becoming an arts therapist. Until her stepfather assaulted her with a claw hammer, resulting in multiple skull fractures and a severe brain injury. She now supports other survivors of brain injury through artwork. Rosanna and Rebecca were joined by Sal Dennis, the General Manager of Domestic Violence Service Management New South Wales (DVSM) – focussed on preventing and supporting recovery from domestic and family violence. She has worked in strategy and development roles within human services for 20 years in London and Sydney. She joined DVSM in 2015 and established Sightlines – its Professional Services Division – driving change in services and system design to both reduce violence and improving responses for people experiencing and escaping domestic and family violence. Nick Rushworth opened the breakfast by describing the odd origin of Brain Injury Australia’s advocacy for victim-survivors of domestic and family violence – from its policy and public education work in sports concussion: “apart from the potential cumulative effects of repeated damage to their brain, victims of serial family violence have next-to-nothing in common with the chronically concussed sportsperson, for example. Nowadays, best practice return to sport only takes place after all the symptoms of a concussion have resolved. Victims of family violence seldom have the luxury of choosing when to return…home. None of this is, or should be, news. It’s as old, at least, as the ‘battered woman syndrome’ legal defence in circumstances where she kills a serially abusive partner. Neither should it come as a surprise, as soon as you consider how instinctive it is – whether in a boxing ring, a pub or a playground – how instinctive it is to ‘go for the head’ in pursuit of violent advantage.” Download Nick’s introduction here.